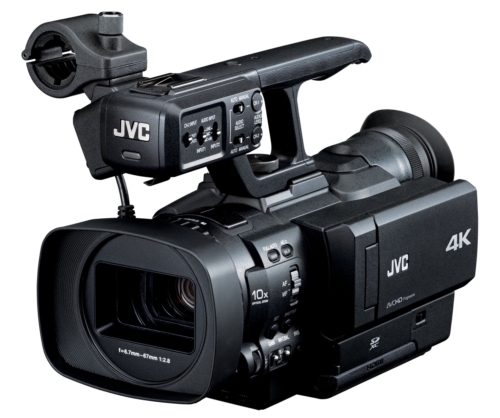 Today, JVC unveiled an impressive new digital camcorder; the GY-HMQ10. While the model number is a bit odd, what the camera is capable of is not. This handheld unit can record 4K stills and video, with the video side producing real-time 3840x2160 resolution video at 24p, 50p, or 60p using the MPEG-4 (H.264) codec at 144Mbps. Files are stored on SDHC or SDXC type memory cards. Other features include a rotating 3.5-inch touch screen LCD, 10x optical zoom with F/2.8 maximum aperture, JVC's "Falconbird" LSI (large-scale integration) processor, an 8.3-megapixel 1/2-inch CMOS image sensor, built-in stereo microphones, two balanced XLR connectors with phantom power, manual audio level controls, and so much more. The unit is set to start shipping in March, 2012, with a MSRP of $4,995 USD. See the full press release below for more details. WAYNE, N.J., Jan. 11, 2012 /PRNewswire/ -- JVC Professional Products Company, a division of JVC Americas Corp., today announced the GY-HMQ10, the world's first handheld 4K camcorder, which captures, records, and plays video images at four times the resolution of high definition television. Powered by JVC's Falconbrid large-scale integration (LSI) chip for high-speed signal processing and a 1/2-inch CMOS imager with 8.3 million active pixels, it delivers real-time 3840x2160 footage at 24p, 50p, or 60p. "We're witnessing the birth of what is destined to become a broad market for full 4K end-to-end production," said Edgar Shane, general manager of engineering. "The GY-HMQ10 is a breakthrough product that opens up 4K imaging to users who previously wouldn't have considered it." High resolution 4K still picture imaging has been around for several years in DSLR cameras. Motion video capture with these cameras has always been done at a lower video resolution because of lack of processing power. Likewise, high end digital motion picture cameras may capture 4K images, but often provide a raw data output to an external storage array for later processing--again due to lack of processing power in the camera. There just hasn't been the ability to capture, process, display and record full 4K images in real time until now. JVC's exclusive Falconbrid LSI processing takes raw image data from the camera's CMOS device and dematrixes (deBayers) it in real time. Unlike many high end 4K cameras, the GY-HMQ10 is able to output 4K images to a monitor or projection system in real time with virtually no latency. This capability opens up applications in cinematography, medical microscopy, telepresence, specialized observation / surveillance, and live wide-view event coverage. Using MPEG-4 technology and a variable bit rate H.264 codec operating at up to 144 Mbps, the GY-HMQ10 records up to two hours of 4K video to economical SDHC or SDXC memory cards. In addition to 4K imaging, the GY-HMQ10 also captures and records astonishing 1080i or 1080/60p full HD, with extraordinary detail provided by its 8.3 megapixel imager and superior lens. HD is recorded on a single memory card in a format compatible with most editing systems. This combination of superb 4K and HD imaging was requested by attendees of JVC's 4K forums, conducted throughout North America last year, and is unique in the camera industry. Another feature requested by forum attendees was the ability to crop an HD image from a 4K frame. This can be accomplished in post production, or in real time during camera playback. The "trimming" feature makes HD cropping easy using the camera's touch panel LCD monitor. Similar in size to JVC's popular GY-HM150 ProHD camcorder, the GY-HMQ10 includes a build-in F2.8 10x zoom lens with optical image stabilizer, as well as a color viewfinder and 3.5-inch touch LCD monitor with a new, intuitive user interface. The GY-HMQ10 is built in a familiar, comfortable and lightweight form factor for hours of field production with minimum fatigue. The GY-HMQ10 is equipped with manual level controls for audio, with audio metering in the LCD and viewfinder displays. A microphone holder and two balanced XLR connectors with phantom power are located on the handle. The camera is equipped with a built-in stereo mic for ambient sound pickup. Other features include JVC's patented Focus Assist, as well as manual and auto control of focus, iris, gain, shutter, gamma, color matrix, and white balance. Plus, the camera has the unusual capability of live 4K output via four HDMI terminals. "Historically, JVC has been a leader in camcorder and display technology, and the GY-HMQ10 is our latest breakthrough," added Shane. "It's part of a larger move at JVC to bring 4K technology to a wide range of customers." In September 2011, JVC introduced an affordable line of 4K projectors to the home theater market. The company's high-end 4K projectors are widely used in commercial flight simulators and planetariums. "4K is the logical step beyond HD," said Shane. "And JVC is uniquely positioned to lead the industry in this new direction." JVC's innovative approach to professional 4K will be unveiled in a series of industry announcements beginning at CES and continuing throughout 2012. At a retail selling price of $4,995, the GY-HMQ10 launches today, with market deliveries beginning in March, 2012. Headquartered in Wayne, New Jersey, JVC Professional Products Company is a division of JVC Americas Corp., a wholly-owned subsidiary of JVC Kenwood Corporation. JVC is a leading manufacturer and distributor of broadcast and professional video and audio equipment, security products including IP network cameras and recorders, premium front projection systems for home theater use, and projection displays and optics used in aviation simulators. The JVC Technology Center provides advanced technology in support of major JVC business alliances. For further product information, visit JVC Professional's Web site at http://pro.jvc.com or call (800)582-5825.